By pyrochild, April 27, 2008 in Plugins - Publishing ONLY! Yes, I know, this plugin is not really worth getting excited over, but whatever. 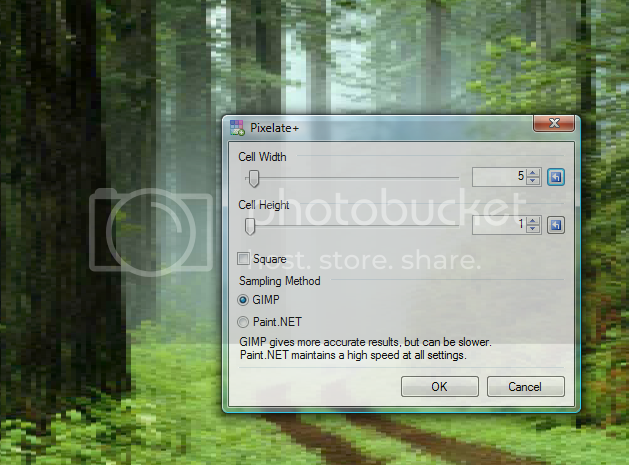 It adds a new sampling mode (the one GIMP uses) as well as the ability to use non-square cells. So, what was the codename for this one again? EDIT: Neither is "peanut." Ruin my thought. A peanut is a legume. And a legume is a fruit. A is a B, and B is a C, so A must be a C.
Anyways, this plugin works well. I am not noticing to many speed differences between GIMP and PdN options though. the GIMP option gets slow when the cells are tall. Increasing width makes virtually no difference, but with a high height and low width, that's when you start noticing the difference. Edit:Pyro, I see what you are talking about now. The difference, for those who care, is that Pdn reads the four corners of each cell, and averages those. GIMP reads every single pixel in the cell, and finds the mean of that. Because of the way memory is laid out, it's very fast to read across an image, but fairly taxing to read up or down, hence the slowdown when there is a high height setting. Only the corners? That's outrageous! Yeah. Horrible, ain't it? Shame, shame, shame. I'm sorry, but when would one ever want to pixelate something? I am very open-minded. I am just looking for an example case when it would be used. I used to think that a gaussian blur is useless because who would want to blur something. Now I use it almost every time I make something on PDN. I used to think that a gaussian blur is useless because who would want to blur something. Now I use it almost every time I make something on PDN. So then you've already learned this lesson. Sure, many times before. The next part is learning when I would use it?
? he wouldn't have taken the time to make this unless someone needed it. use that noodle and get creative. clue..... most people incorporate it into textures. since most plugins are seldom used alone but in conjunction with other plugins it will be part of a making some extreme texture. As do I, but this is not the proper venue nor is it the proper time.